On the heels of a resounding success sharing Reiki at the Asheville Wholistic Integrative Fair, I am called to make a special announcement. 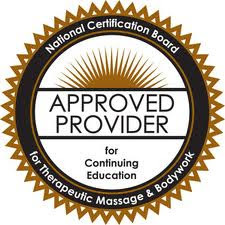 Starting today, Blue Mountain Reiki will no longer be charging specific fees for Reiki sessions. Instead, I am moving to a 100% donation model for session work. At the fair, I was blessed with an unending stream of those who wished to receive Reiki, some of them for the very first time. I left out a donation jar and invited anyone and everyone who stopped by to hop on my table for free. 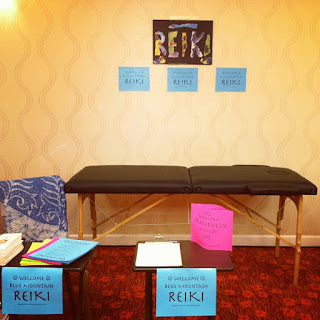 By the end of the day, practitioners all around me were breaking down there booths, and I was still doing Reiki. When I got home, I counted up my tip jar and found that the universe had provided me with EXACTLY the cost of my booth fee for the fair, plus five dollars--probably the approximate cost of my gas to get there! WOW. I had been sitting with the idea of moving to a 100% donation model for Reiki sessions and had felt like the fair would be a good place for me to see how that worked. The universe spoke loud and clear: When I opened my heart and my hands to provide for people without any attention paid to money coming in, the energetic exchange was--practically to the penny--exactly what I needed. This was the sign I was looking for! I am putting my faith and trust in the source of Love and Light that is truly the one offering the Reiki, and I am honoring my place in the energetic foodchain by offering my time as mirror, witness, and channel for healing without attaching a pricetag to that. My teaching fees will remain as they are, but my heart has led me very specifically to open up my Reiki session offerings to any and all who wish to have them. Even those who cannot afford regular session prices still need and deserve healing. And so, I open this new doorway to the future of my practice by inviting each of you to honor our time together only with what you are truly able to afford and called to offer. I am very pleased to announce that Blue Mountain Reiki will be participating in this year's Asheville Wholistic Integrative Fair! The 2013 fair will be held on Saturday March 9th at the Asheville Renaissance Hotel at 31 Woodfin St. in downtown Asheville, NC. I will be offering free mini Reiki sessions to all who stop by to visit the booth, and I will also have pamphlets detailing what Reiki is and how it works, as well as flyers for my upcoming classes. I sincerely hope you'll drop by and give me a hug and get some free Reiki!